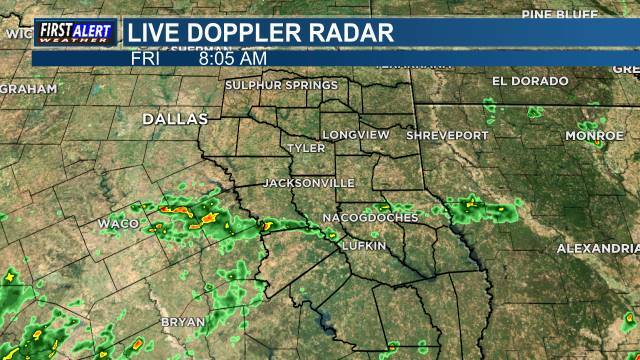 EAST TEXAS (KLTV/KTRE) - Here’s the weather where you live: We are expecting strong storms to move through East Texas today. The biggest threats that we are monitoring right now are very gusty winds, up to 35 mph and brief periods of heavy rainfall. We should begin to see clearing for most of northern and central East Texas by the early afternoon. Our southern counties will be clear by the later afternoon and early evening. A weaker cold front will pass through early on Thursday morning, creating a few light showers, but clear skies will follow moving into the later morning hours. Once all of this wet weather passes through we will see sunshine for quite some time. Thursday and Friday will still bring gusty winds, between 20-25 mph. For the weekend temperatures will be in the upper 50s and low 60s with sunshine and light winds. Into the start of the next work week, we will keep the sun and 60s.